Your wedding is one of the most important days of your life. It takes so much time to plan but your wedding reception only lasts a few hours. 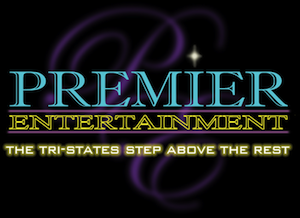 Premier Entertainment will make those few hours into a lifetime of wonderful memories. With over 20 years in the industry we provide experience, satisfaction, and dedication to our brides and grooms that is second to none. Premier Entertainment’s talented entertainment specialists help brides and grooms design their special day by taking their ideas and dreams and bringing them to reality. We will use our decades of entertainment background and knowledge to make your day, your one-of-a-kind reality… We encourage you to take the next step by calling and speaking to one of our entertainment specialists. Then come in and see for yourself, how our services can make your celebration a once in a lifetime forever memory. Premier Entertainment will help you to create the atmosphere of unforgettable fun and laughter at your wedding reception. Your day should have a reflection of you and your fiancé’s shared styles and tastes. Premier Entertainment will help you put this all together so you can live, love and dance every moment of your wedding day until the last song plays at the end of the night. Let our entertainment specialists transform your event ideas into your heart’s desire. They will create the perfect atmosphere from your cocktail hour, to your first dance, to you beautiful send off at the end of the night. It’s all about what you’re expecting and how we can help you to put it all together… from lighting enhancements to follow spot introductions… or to a perfectly lit room with dry ice filling the dance floor. Imagine ‘dancing on the clouds’ during your first dance. Have our super high-tech photo booths, kiosks with social media connected photographers ‘snap and post.’ Have a one-of-a-kind design, with a red carpet and photographer added to your DJ entertainment. Boost the atmosphere with a live percussionist or other musicians. No matter what your thoughts, ideas and dreams, we will help you design your day. With over two decades of full-time wedding entertainment experience and the earned name tri-state’s step above the rest, Premier Entertainment is a company you know you can trust with your special day. Let Premier Entertainment give you the wedding of a lifetime. Take the next step… We look forward to helping you put the starting touches on the biggest day of your life. Congratulations!